So my buddy BrandonKahler and I had this great idea. We wanted to design a ship that can create a wormhole anywhere. So i went and made a design and some rules for it. However we are not agreeing on a theory for wormholes. This has led me to make two designs. 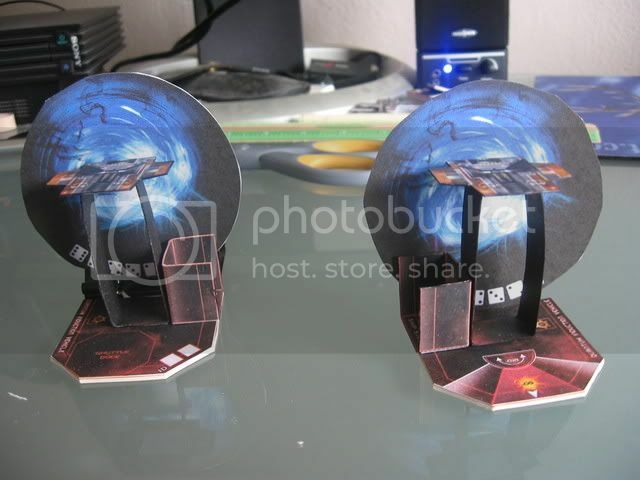 I've printed up and made a prototype of each one, but i want some external views on our disagreement. So without further ado i give you some pics. 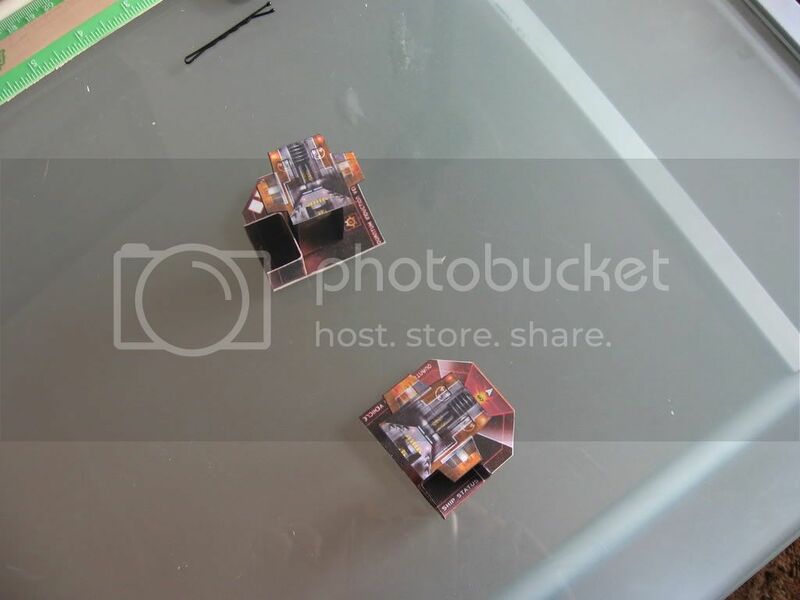 In order to put the wormhole through the center of the ship i removed this tiny strip and added some side supports to the stems to hold the two halves together. slits down the center of these supports held the bottom part of the wormhole. This is the QIV with the wormhole placed in the center. I've been thinking about making this version into a kitbash, even if Brandon and i go with the other design. My theory wormholes are more like a tunnel between two points of space. The End of this tunnel is represented as a 2D doorway, accessible from front or back. Since no part of the QIV passes into the wormhole the qiv halves stay put and the wormhole bisects the ship. Now the other half of the debate. If you have read Brandon's posts here, you'll notice that he likes more complex ideas. in fact he often starts more complex than necessary. He won't accept that as part of my argument this time though. So this is his version. Split the ship in half and split the base in half. Note the bobby pin behind holding the two halves together. It will be replaced with magnets. The two halves are each one of the ends of the wormhole. My current dilemma is figuring out how to hold the wormhole here, the clip doesn't quite cut the mustard. His Theory is that wormholes are simply a fold of space time. point A (the ship) and point B (empty space) are touching. That which was at point A (the back of the ship) is now at point B, and that which was at point B (empty space) is now at point A. 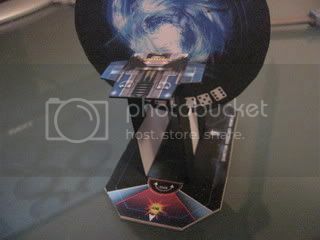 The fold in space is in the center of the ship, so half of the ship must be on the other side of the fold. I have asked him to make his point here and i want comments from others too. The fact that, according to the rules for the game Wormhole, the wormholes used here can link to multiple Wormholes, can be "hacked" to change these links, and can even be collapsed (by destroying the generator that keeps it stable) without having any effect on any other wormholes directly connected to or from this wormhole, seems to lend support to your theory. Travel also doesn't necessarily work in both directions, as by the rules. Whoo! one point for me. 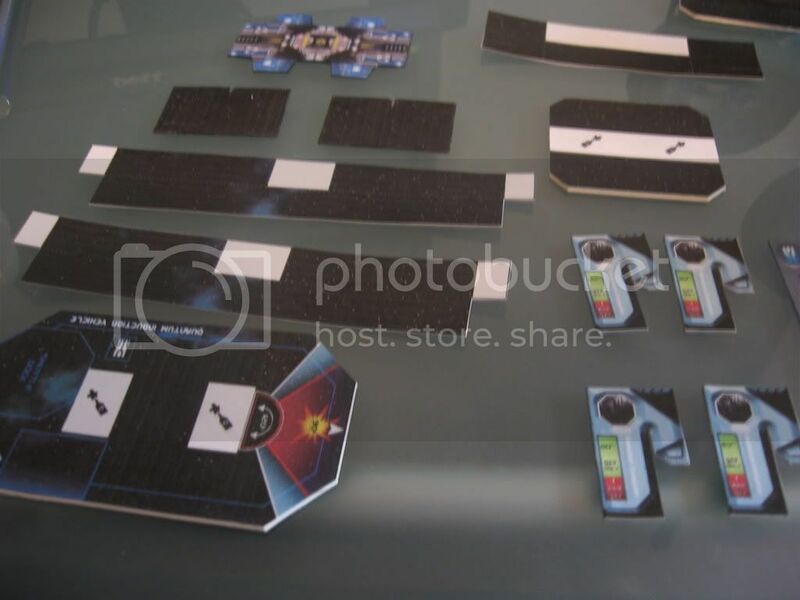 Yeah essentially what i had planned was the ship took a turn to charge like the particle bow, then next turn it placed a wormhole token of some kind within like 24 inches. at that point the ship pretty much acted as a wormhole generator as long as you keep using the "maintain wormhole" special ability. it is not allowed to move or attack or even repair while maintaining a wormhole. This is the only disagreement we haven't resolved. 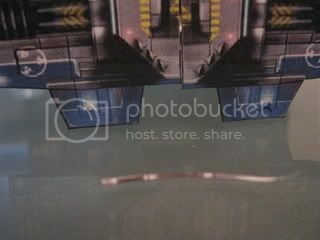 We've concluded that the ship can buy a Quantum computer Modchip which would allow you to open a wormhole on another ship. the logic there is that it's nearly impossible to calculate where the target ship is going to be when you open the wormhole. Opening a wormhole on another ship would destroy both however. I think a 30 point cost for the Quantum Induction Vehicle and 30 points for the quantum computer would be fair. Could you imagine the wormhole opening up and like 3 hammerhead missiles coming out? i'm looking forward to seeing that. Hacking wormholes already is fun. Making wormholes, then hacking existing routes sounds like twice the fun! You will have to work out rules for determining color and count for the newly generated wormholes, if people using those also use the expanded rules. Does a newly generated wormhole start at count 0 ? Does it start with a randomy determined (=rolled) number? Can the number be chosen freely by the creator? How can it be hacked? Does a QI mechanism alsways create blue wormholes? Does the damage on the generating ship have the same effect on the wormhole as the status of a conventional wormhole generator? These questions will all determine ho useful the QI ability is, and thus, how many points it should cost you. hmm. you brought up a point i never even considered yet. hacking the wormhole generated by the ship to make them connect elsewhere on the map. I was just thinking of a unique wormhole that connects only to its destination point. maybe it could dial in to the preexisting wormholes at will. however when you do that the destination wormhole would close. we wanted to be able to send a small fleet in behind the enemy, or right on top of them and ram. But that sounds like a whole different usage. Crazy fun! 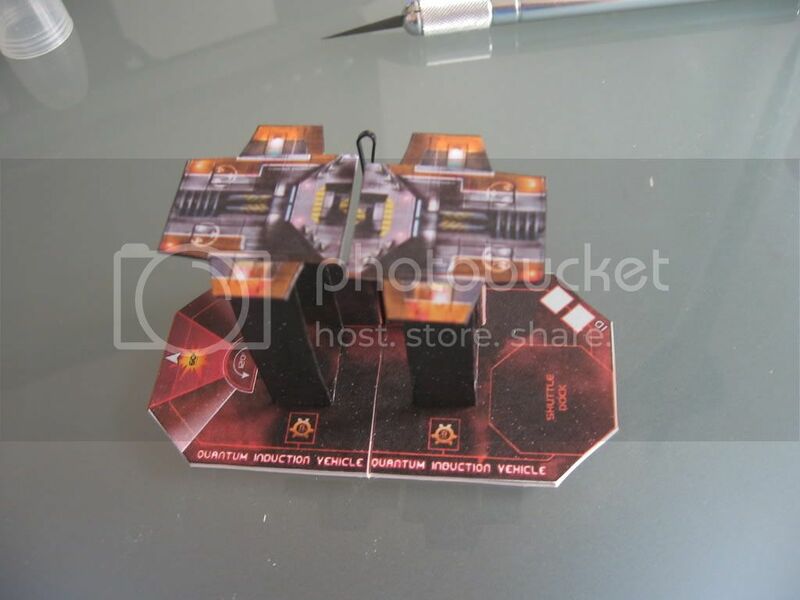 Its funny, very early on in development we had a mobile Wormhole generator. Would love to see this in the kitbash section! You should make a rule relating to the explosion radius that this kind of ship would generate upon destruction. Something BIG! Brandon has insisted that a Ship generating a wormhole would boom very very large. so big in fact that it doesn't print on a single 8.5X11 sheet of paper. I'm sure we'll find out how big ridiculously large can be. I agree with him on that point as well. Making it work with 1-page-booms is pretty simple. Generate the BIG boom in a way similar to the old barrage placement rules in GW's early EPIC or a half-dozen other games. Here's my approach: Place the big one-page boom template centered on the ship. Place a second, equally large boom template in direct contact with the first, in the direction the ship was facing. Place a third template in direct contact with the first, touching the opposite point. Work out damage to anything touched by the templates as usual. this is not a wormhole generator. So it's got no damage counter or fancy frame the wormhole is generated by the ship and the ship tracks all damage. Ah, okay. So it basically creates a one-way route. How is the exit point determined? Is it always the result of generating the exit over an enemy ship you target with an "attack" that causes the wormhole to appear, or can you target any point in space? Does it require line of sight? Will it have a maximum range? 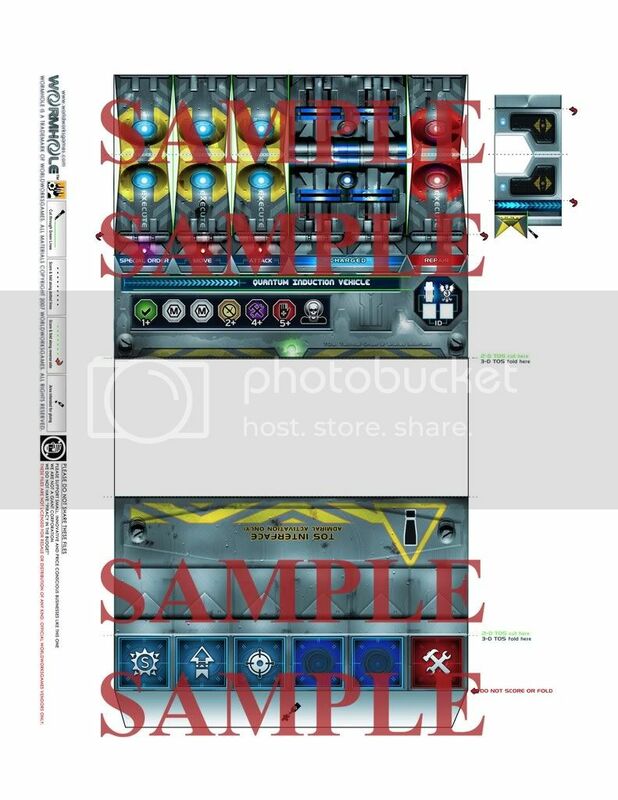 Or will it just generate a connection to any other QIV, in which case one could act as part of a fast vanguard with the other one hanging back with the main fleet, operating as a pair (or a trio, so that the opponent will not know which flanking vanguard will pull the main fleet in)? All this will affect the "power potential" of this piece and the impact it will have on the game. It's going to be a 2 way wormhole. 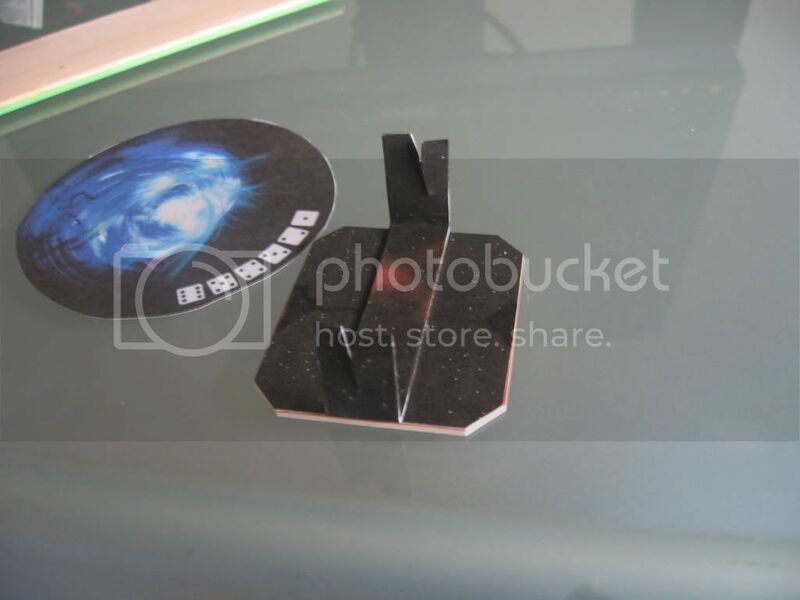 The destination wormhole token can be placed within 360 degree arc up to 24 inches from the ship, however when it reaches powerloss it will be drastically reduced to about 10 inch range. Opening the wormhole requires only 2 turns. turn 1 charge. 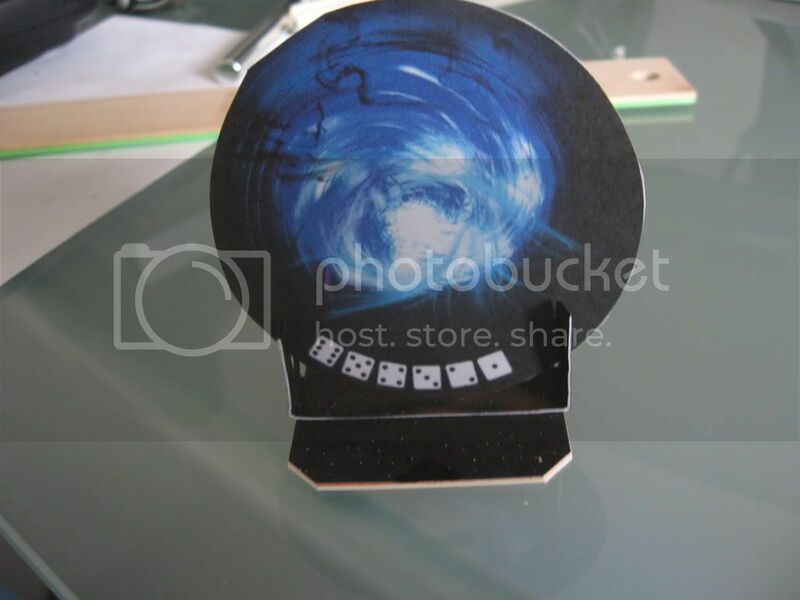 turn 2 place the wormhole token. Then it can be used by either players ships from either end. 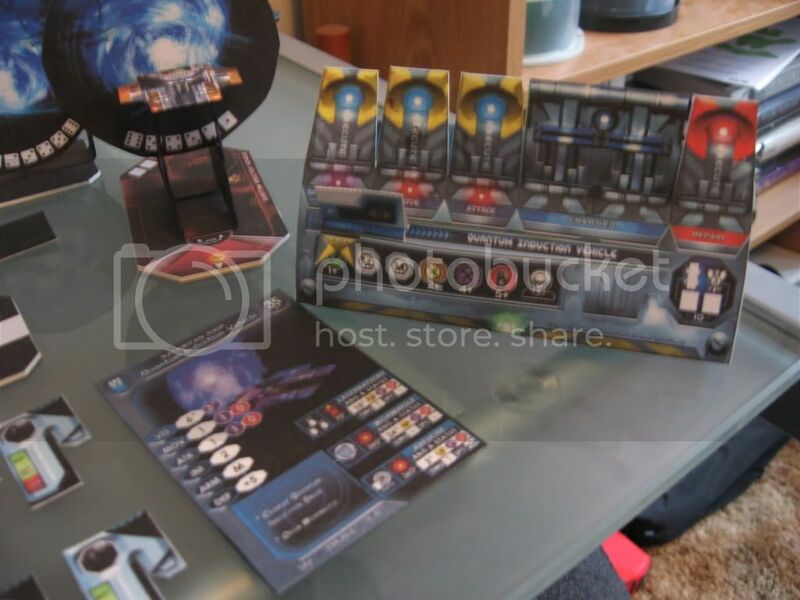 The player controlling the ship chooses the destination and must use a special command each turn to keep it open, voiding all other commands. If the special command is not given the wormhole collapses. You could pop a fleet in behind the enemy do a fly by for 2 turns while the QIV charges again and open a destination wormhole in front of your ships to bring them back. This opens up all kinds of flanking, and maneuvering, and surprise moves. Part of the reason My friend wanted the split the ship was that he wanted it to be vulnerable from either wormhole. This way it's much riskier to put a wormhole exit near the enemy fleet. The way i see it though, if a ship is already aimed at the wormhole it can travel through and, just like a wormhole generator, be placed anywhere touching the base of the QIV. I believe the rules state it could even be pointing straight at the QIV when it exits. I like the whole idea very much. I guess I'd also like to build a similar ship, in order to toy around with the idea, if you both don't mind; though I might employ a slightly different design. Damn, I really like the idea. Makes for an interesting tactical twist. I wouldn't use QIVs in every game, though - but for a special scenario, it sounds both really challenging and fun. You can make a different design if you want, but i plan to make the solid base version a kitbash. I'm going to make a TOS and a page of rules. The farther along we get the more rules need to be clarified. Last night we worked out a way to determine the exit direction of a ship that was "forced through" using the Quantum Computer modchip. Theoretically a quantum computer would be able to open a wormhole mere nanometers in front of the moving ship. they could not avoid it. however they can roll 1 die. on a 6 the quantum calculator erred. the wormhole is off enough for the target ship to avoid the wormhole altogether. on a 1, 2, 3, or 4 the ship comes out touching a predetermined side of the QIV base. 1 being front. 2 being the right side. 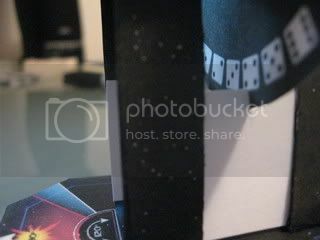 3, the back. 4 the left side. and on a 5 the target ship's owner chooses which side, facing away from the QIV. on a 1-5 their movement tab is voided since they "moved" through the wormhole out of the movement turn. i know quantum computer means it calculates in all possible universes and cannot make an error, but it's the most fair idea we could come up with. it's a 6 sided die and an 8 sided base. It wouldn't be fair if the QIV owner always picked the direction and it often wouldn't be worth the effort if the target ship always picked the direction. not to mention we like a sense of randomness and luck in our gaming. medium armor and only 3 marks to reach power loss. I like your idea but just to make sure I understand: your version uses a standard (solid, uncut) ship while Brandon's uses a ship that is split in half? If I am understanding right why not have both so each player can decide how wormholes work within their games. Put a faint dashed line across the model (or work a line across it in the texture) that the player can cut if they want but dosn't stand out if they prefer your method. On the base just put a guide line outside the border of the base for if they wanna use that method. That way after the second race is out you can use one version for each race showing how they do the same task in different ways. Both ships are actually split in half (to accommodate the Wormhole), it's just that one also uses a base that can be split. @L522: The TOS looks really good. Great job. Thank you. I am especially proud of how well the wormhole symbol turned out. it's pretty much just color replacement of the attack symbol and the twist effect. I'm learning quite a bit in photoshop doing this little project. I think i want Denny to have the Quantum Induction Vehicle test played. I've got everything made up. all i have to do is write up a page of rules. I assigned a point value to the ship and the mod chip but they may need to be changed. That's why i want to have it play tested. the ship is valued at 35 points and the modchip is valued at 20 points. You pretty much nailed it. It's ship size but i had to use two stems to hold it up so the base got elongated. the stems are just the stems from the particlebow frigate. I guess its just that the WH generator sits so close to the table then, thanks. Wow, I need to read more threads. I just saw this today, and I had a mobile WH generator half done months ago before I saw something shiny and got distracted. Looks great, and I like your 'projection' ideas more than what I had. Did this ever get submitted? sadly, i too got distracted by something shiny. i could probably have a submittable bash soon. i'll pick it back up again. I should be able to finish and submit it in the near future. 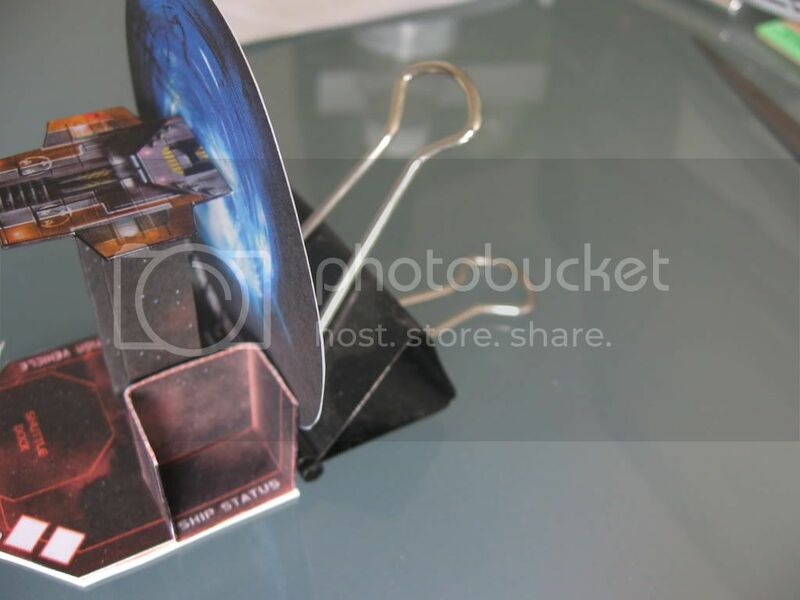 I just wonder how much interest there is for a mobile wormhole generator. *raises both hands* *raises foot* *raises children* Me! Me! Wait, if your arms & legs are moving, does that make you an UNDEAD BUG RUNNICLES?!?!??!!? Honestly I think this bash will see a lot of use especially once we relaunch the kitbash area. Keep on truckin! 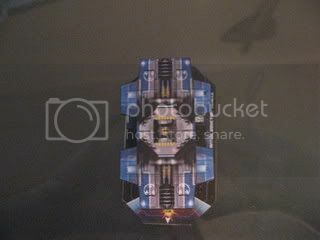 I have submitted the ship design as a kitbash. 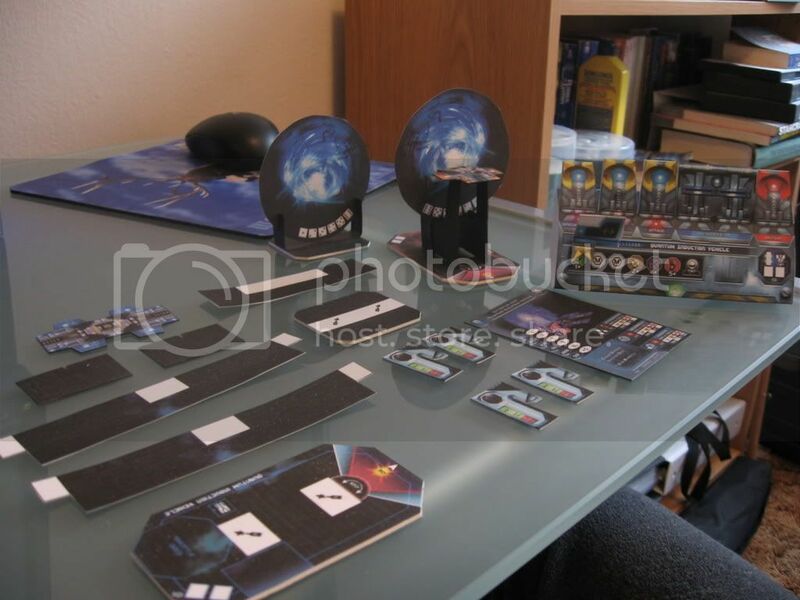 It includes a TOS, a wormhole token, and a page of a stat card and modchip as well. Enjoy.